Defense Minister, Yaacoub Sarraf, currently on an official visit to Russia, on Wednesday contacted by phone Lebanese Army Commander, General Joseph Aoun, and congratulated him on the outcome of the Army's offensive on terrorism. Aoun briefed the Minister on the battle developments. In turn, Sarraf praised the great sacrifices made by the army in order to liberate Lebanese territories from terrorism. Minister Sarraf also briefed Aoun on the atmosphere of talks with Russian officials and on their support for Lebanon in its "Fajr Al-Jroud" military operation. Sarraf kicked off activities on the second day of his official visit to Russia by holding talks with his Russian counterpart, Sergei Choigou, in presence of the Lebanese and Russian delegations. The Russian minister commended the achievements of the Lebanese army in the offensives against "Al-Nusra Front" and "Daesh" terrorist organizations, stressing the need to work towards ending their acts in the world. He also stressed the importance of concentrating efforts and strengthening cooperation in the fight against terrorism. Minister Sarraf, for his part, stressed the importance of finding solutions to regional problems, and outlined the achievements of the Lebanese army in the fight against terrorism. He then discussed the situation of Syrian refugees and its repercussions on Lebanon. Sarraf also touched on Daesh's military hostages case, which is a priority for the state and the army's command, calling for more efforts and clarity about their fate, as well as that of the abducted bishops and cameraman Samir Kassab. The two ministers also discussed Russian military aids in Lebanon and ways to strengthen Lebanese-Russian cooperation. 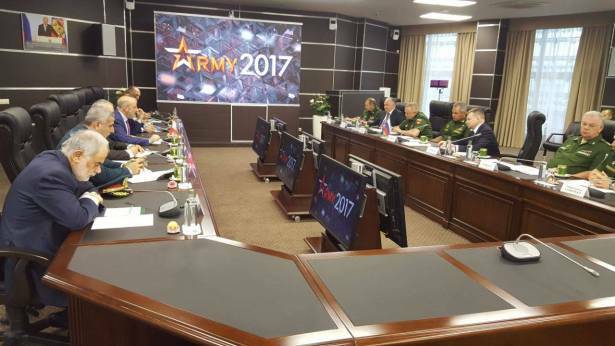 The joint committee will hold meetings in September in Beirut on military cooperation planned for 2018.